Sugar and nougatine need to be kept at a workable temperature and texture, so they can be formed and stretched into the desired shape. The sugar mixture is placed on a heat resistant, removable silicon mat, which sits on a base underneath a heating lamp. 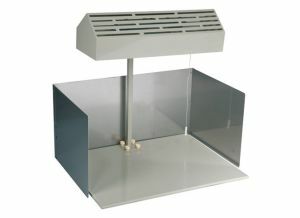 The lamps are usually 500W or 1000W and can be height-adjusted to obtain the required temperature.